After Indra injured Hanuman when he was chasing the Sun, his father Vayu was quick to avenge him and entered the bodies of all gods and gave them colic. Indra apologized to Vayu and agreed that Hanuman should become immortal. All the gods came together to bless young Hanuman in a cave. 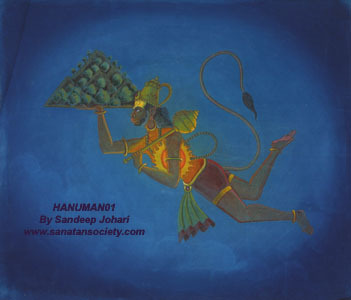 This painting is part of a series of 50 paintings on the Life of Hanuman that is currently being made by Sandeep Johari. Untill the series is finished, the paintings are not for sale. Reproductions are for sale to support this magnificient project undertaken by the artist.